Lord show us things to come…! 2019 is a year that ends a decade and 2020 will be the beginning of another. It coincides with the Biblical Year 5779 …and on the 30th September on Rosh Hashanah (Feast of Trumpets) will change to Year 5780 so we see it is also the closing of a decade and the beginning of another. The current Biblical Year 5779 on the Gregorian calendar - 2019 is the closing of a previous decade as numbers 1-9 are all addition numbers until we get to 10 as it ends with a zero - "0" and thus next Biblical Year 5780 will correspond with 2020 both neutral numbers. If we look at the Year 2020 and take the last two numbers (20) and add it to the next Biblical Year 5780 last two numbers (80); 20 + 80 = 100 (end of a century and beginning of the new). Years which ends in "0" are all neutral numbers (zero "0" counts for "nil"). They all begin a new cycle… i.e. 21; 81; 101 and are also the end of a previous cycle… i.e. 19; 79 and 99. When we ignore the "zeros" of the neutral numbers of the Gregorian Calendar Year 2020 we remain with 202 and Biblical Year 5780 we remain with 578. Now add: 202 + 578 = 780 we get the last three numbers of the next Biblical Year 5780! Nothing is coincidence with God! 578 BC was during the time of one of the great Prophets - Jeremiah (643BC-568BC). Jeremiah was called of God and set apart even before he was in his mother’s womb (Jeremiah 1:4-8). Jeremiah is referred to as “the weeping prophet” …as he wept on behalf of the nation of Israel for their sins and rebellion committed against God and the coming judgement on his people (Jeremiah 7, 26). Jeremiah was active around the time of the destruction of the 1st Temple in Jerusalem as Judah would fall. As such he played an important part in keeping the nation together after the terrible destruction and exile of the Jewish people. Jeremiah remained celibate after God instructed him not to marry as a “sign” of loneliness that would come upon the “apostate people” of Judah (Jeremiah 5:3-4; 6:19) after they were exiled from their land. When the Babylonians were already invading the land …Jeremiah bought a field! While this may have seemed like a waste of money and although Judah would fall, the Temple destroyed …and the people exiled, Jeremiah was pointing towards “future” restoration. After 70 years of exile in Babylon a remnant would return and rebuild the (2nd) Temple and restore Jerusalem. “Turn us back to you, O Lord, and we will be restored; renew our days as of old.” – Lamentations 5:21. Jeremiah authored the book of Lamentations (originally Lamentations and Jeremiah were one book and Jeremiah wrote both) that is recited on the 9th Av (the day when the 1st Temple was destroyed) in Israel every year on this day. 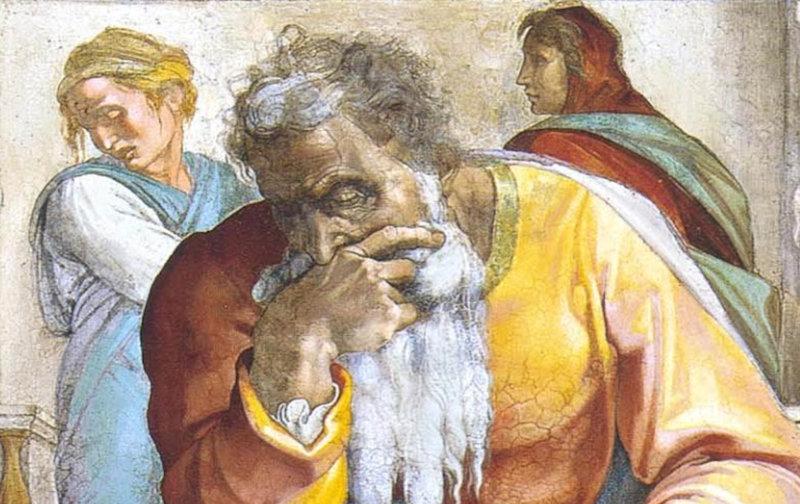 Jeremiah was a dramatic and visual prophet to dramatize the message entrusted to him by God and often used symbolic visual illustrations. Jeremiah smashed a clay jar (Jeremiah 19:1-15) in front of the leaders of Jerusalem to dramatize how the Temple was going to be destroyed. Jeremiah walked with a yoke around his neck (Jeremiah 27:1-13) to demonstrate that the stiff-necked people of Judah were going to come under foreign oppression! Jeremiah describes what he witnessed of the judgement of God upon immoral and idolatrous Jerusalem; deserted, destroyed, in distress, desolate, devastated, dishonoured, despised and destitute! Why? Because, of broken Laws of God as the people refused to obey Him as Lord – they lost their land to “foreigners!” (Lamentations 1:5-6; 1:14). The people had turned away from God and judgement came! Let’s pause for a moment here… Does this not remind us of our day? Are our Western countries built upon Judeo-Christian values also being invaded by “foreign people” today? We clearly see that in Europe most are young Muslim men invaders with few women and children from Islamic countries? Are our Western Countries which were founded upon the Bible no longer obeying God and His Commandments? Are we simply immune to God’s judgement and as Gentiles and allowed to do whatever we wish …and God’s judgment only for Jews? Our God is a God of mercy, but judgment surely does come …and it WILL come make no mistake about this! Our Abba Father is a loving Father who disciplines those He loves and does so that we can turn from our evil ways and turn back to Him. There are many examples of God’s mercy and plan for the Jewish people and Israel throughout the Bible. “Let us search and examine our ways, and turn back to the Lord; let us lift our hearts and hands to God in Heaven. We have transgressed and rebelled!” – Lamentations 3:40-42. Another great Prophet of God - Ezekiel was also active during this time… Ezekiel (622BC-562BC) was born into a Priestly family Zadok in 622 BC and at the age of 30 years began his priesthood and was called a Prophet. Ezekiel was 25 years old among the first Judeans to be deported into Babylon exile when Nebuchadnezzar first captured Jerusalem. Ezekiel’s name means; “God strengthens!” Whilst Jeremiah was warning the people in Jerusalem, Ezekiel was ministering amongst the exiles in Babylon at the same time that Daniel was serving in the courts of Babylon. Ezekiel overlapped the end of Jeremiah’s ministry and the beginning of Daniel’s. More than a century before, the 10 Northern Tribes of Israel had ignored the warnings of the Prophets Amos and Hosea and had been judged for their “immorality” and “idolatry” - conquered by Assyria and exiled out of the land. Despite the disaster that had destroyed the Northern Kingdom of Israel, Judah indulged in “immorality and idolatry” – ignoring the Prophets Micah, Habakkuk and Jeremiah! The people of Judah even degenerated to the extent of sacrificing children to the pagan god, Molech (in the Valley of Hinnom, Jerusalem, which our Lord Yeshua (Jesus) used to describe Hell – Gehenna, the rubbish heap that kept burning). Ponder here for a moment… Has not our society today accepted the practice of killing millions of babies under the name of “family planning” or “abortion?” Abortion doesn’t make women un-pregnant – it makes them mothers of dead babies. Are we immune from God’s judgment of murder of children? Statistics show that during 2018 an estimate of approximately 1 million babies were killed through abortion! The danger of God’s judgement upon wickedness is far more serious danger than that of an invading army threatening a city. One may be able to defend a city against a “foreign” invader …however NO ONE can escape the scrutiny of an all-knowing, everywhere present, all-wise God! Nor can anyone escape judgement from an omnipresent Judge and neither can anyone have hope of victory in a war against - Almighty God! 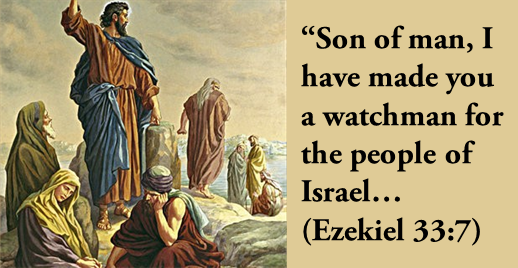 God wants us to be His “watchmen“ for Israel and “stand in the gap” for Him during these Last Days. In ancient times large “watchtowers” were placed overlooking the fields of agriculture and men would stand watch and guard the fields which contained the community’s food supply. “So I sought for a man among them who would make a wall, and stand in the gap before Me on behalf of the land, that I should not destroy it.” – Ezekiel 22:30. A wall is a barrier to keep the people safe and keep the invaders or enemy armies out physically and at the same time we are to stand in the gap in prayer on behalf of the nation (2 Chronicles 7:14). The “watchmen" needed to be alert to any treats, thieves or fire and from any “sign” of an enemy army approaching or any “sign” of invasion. At the sign of any threat a loud warning would sound through the city from the WALLS so that the town could shut its gates and prepare to defend against any attack or invasion! Yes, walls do work! The Leader of a country or nation has the obligation to keep its people safe and protect their nation’s borders. A country without walls or borders is no longer a country! Today we see lawlessness within what once were peaceful EU Nations and other Western Countries because they are following the leadership of godless leaders who are pushing their “One World Government.” We truly believe God has raised up US President Trump and Israeli PM Bibi Netanyahu who are truly God’s “watchmen on the WALL” and protectors for their nations …and for the West! God gave the Prophets Ezekiel and Daniel supernatural insight, foresight and oversight into our generation’s “Prophetic” future… The Books of Ezekiel and Daniel are the best examples of “Apocalyptic” (unveiling) language in the Old Testament and they have are more prophecies than in any other prophets of the Old Testament. The book of Revelation CANNOT be understood without carefully studying the books of Ezekiel and Daniel - on which Revelation is clearly based! Repetition shows importance; “Then YOU will know that I am the Lord” – appears 74 times in Ezekiel. In Chapters 4-24; regarding judgements on Jerusalem the wording is; “Then YOU will know that I am the Lord” and in chapters 25-32 in the prophecies against the Nations the refrain is; “Then THEY will know that I am the Lord.” In the last section of Ezekiel, chapters 33-48 which deals with the restoration of the Temple, the wording is; “Then the NATIONS will know that I am the Lord.” In chapter 11; Ezekiel declares that “the Glory of the Lord has departed from the Temple” because of the wickedness and ungodliness of the priests, kings, princes and the people of Jerusalem. What about our generation today? How many Pastors, Churches and even people of God (Jew and Gentile) have simply accepted the world’s way and have become lukewarm in teaching the truth about sin? Why fear offending… abortionists, LGBTQ homosexuality, Liberals, Socialists, corrupt Liberal Media (which deceives or denies publishing or speaking truth), so-called Hollywood elites, Muslims, even Satanists or other religions? Why not be afraid to walk in the FEAR of offending God instead? We as Judeo-Christian believers in Yeshua (Jesus) are ALL called to preach the truth in love and in doing so bring the godless to repentance and to the knowledge of the Lord’s mercy of Eternal Salvation! We are surrounded by dead, luke-warm churches and confronted with lifeless disorder just as the Word of God warned us it would be in the Last Days (Revelation 1-3). Just as the dead Lazarus was raised by the power of the Word spoken by our Lord Yeshua Himself; “Lazarus come forth!” (John 11:1-44) …so we can see the power of the Word of God, as it is faithfully proclaimed, bringing the spiritually dead to life! The book of Ezekiel begins with “doom and gloom” …but ends with a glorious vision of “hope” as God Himself intervenes and establishes His Kingdom on earth, to bless the nations! The “sign of Jonah”… If we look back to 780 BC (last three digits of the coming new Biblical Year 5780) we find that an interesting person is introduced; the prophet Jonah (Jonah means; “dove”). The Pharisees were wrong when they claimed that; “No prophet has risen out of Galilee!” – John 7:52. The city of Joppa, from where Jonah embarked on his journey to Tarshish (today Spain) to avoid preaching to Nineveh (today Mosul, Iraq) …was the very place that God chose 800 years later to reveal to the Apostle Peter his commission to receive men of other nations. At the Jerusalem Council (Acts 15), the Apostle Peter refuted the Judaizers of the early church by reporting on what God had revealed to him at Joppa, and the coming of the Holy Spirit upon the Roman Centurion Cornelius’ household (Acts 15:7-17). Most people relate the book of Jonah (Nevi’im books of the prophets in Hebrew Bible) to the prophet of God being in a belly of a fish (whale) for 3 days and 3 nights! Our God is sovereign and He called Jonah and He sent the storm to prevent Jonah from fleeing from doing His Will! Our God controls the winds and the waves – and is to be feared. God is merciful and gracious. Although the wicked city of Nineveh deserved to be crushed immediately, God was patient towards them …and sent a reluctant prophet, Jonah who originally ran from God before delivering a message of “repentance” to the nation of Nineveh … who repented! Jonah speaks of being cast into the deep, into the heart of the seas, with the waves passing over him and the waters surrounding him even to the soul (Jonah 2:1-10). It takes 3 minutes to be deprived of air for a person to die… but to sink to the bottom of the sea takes a lot longer. Jonah describes himself as being in “sheol” – the abode of the dead. So when Yeshua (Jesus) speaks of the “sign of Jonah” …He is referring to His dying and being raised to life on the 03rd day. Jonah is the most outstanding example of the “Resurrection” in the Old Testament! The “sign of Jonah” would turn out to be our Lord’s greatest miracle of all. Yeshua’ resurrection from the dead would be God’s chief sign that Yeshua was Israel’s long-awaited Messiah (Acts 2:23-32) and establish Christ’s claims to deity (Romans 1:3-4). In the time of Yeshua’ (Jesus) “the Sign of Jonah” means that if Israel will NOT repent God will take it from them and given it to the Gentiles. Yeshua says elsewhere to His fellow Jews… “Therefore I tell you that the kingdom of God will be taken away from you and given to a people who will produce its fruit. - (Matthew 21:43. Further, just as Israel’s ancient refusal to repent led to destruction by the Assyrians, so now Israel’s refusal to repent meant destruction by the Romans which definitively took place in 70 AD when the 2nd Temple was destroyed and all this was prophesied by our Lord in the Mount Olivet discourse (Matthew 24:1 until 25:46; Mark 13:1-37; Luke 21:5-36). Over a million Jews were lost in this horrible war according to Historian Josephus. Someday soon the Jewish people will see clearly that Yeshua was and still is their Messiah too. In our time consider that “the sign of Jonah” may today be active in the death of the West as we know it… We know that this may be controversial but statistics prove that birth-rates have dropped dramatically …and the Western nations are well below replacement level. In effect we are aborting babies in the name of “family planning” and contracepting ourselves right out of existence. And, God has loosed judgment on us in the form of the “Sign of Jonah.” Currently in France the Birth-rate is 1.7 children per French woman (well below replacement level). For Muslim Women in France the birth-rate is 7.1 children. Most other European countries have equally dismal rates. Do the math and realize that Europe as we have known it is coming to an end. Islam is growing at a far greater birth rate than the West …and with the current invasion from Muslim countries into the West – how long will the Western nations exist? You decide! “A wicked and adulterous generation demands a sign, but none will be given it except the sign of the prophet Jonah.” – Matthew 12:39. “Signs” and “Times” of “great divide!”… We have entered into days of “great divide!” Just look at what is happening in the world. The ungodly have literally taken over the airwaves with lies by the corrupted Fake Media, Hollywood ALL with same purpose to control Governments, UN, EU, Educational Institutes. They are glorifying LGBTQ and murder of babies - abortion and in fact anything that the God of the Bible hates. At the same time we have an acceleration of time and “a time of the suddenlies!” When the fullness of preparation meets the fullness of time, it results in “the time of the suddenlies!” It is like a woman giving birth to a child, there are nine long months of formation - followed by uncomfortable times of stretching and right when the expectant mother feels she cannot carry the child any longer - suddenly transition kicks into gear and the greatly desired birth comes forth! We are entering into “a time of the suddenlies!” As we march into these critical times, there is a dramatic escalation of activity in the “Spirit world,” being mirrored in the “natural realm.” Both dimensions reflect the intensity of the Last Days heavenly battle that seems to be kicking into higher gear. Not only are these times extremely crucial …they are days of great advances! God is never taken by surprise. He is not sitting in heaven with sweaty palms or wringing His hands in a nervous frenzy. In fact, according to Job 36:32, “He covers His hands with lightening (glory) and commands it to strike the mark.” Darkness is an excellent backdrop for light to shine its brightest! Think on this… Isn’t it just amazing that today the nations are obsessed with the fallacy of “climate change?” And, isn’t it amazing that way back in Noah’s time (Genesis 6) that it was also an issue of “weather!” The people during the time of Noah did NOT see the “signs” of the pending flood and judgement for sin! They were so far from God that they no longer recognized that it is God Himself who changes the “times and seasons” …and that it is God that controls the climate and weather (Genesis 1:14-18, 8:22; Psalm 104:19; Isaiah 55:10-11; Daniel 2:21; Acts 1:7). These End-Time Days are much the same - the “signs” and “warnings” are there …BUT, the people that are far from God do NOT see this! Judgement is surely coming! Yes, the Bible does say that we CANNOT know the exact time of the Lord’s return (Matthew 25:13) …however, the Scriptures make it equally clear that we CAN know the “season” of the Lord’s return! (1 Thessalonians 5:2–6) This passage asserts that Yeshua (Jesus) is coming “like a thief in the night.” But, then it proceeds to make it clear that this will be true only for the pagan world and NOT for believers. His return should be NO surprise to those who know Him and His Word, for they have the indwelling of the Holy Spirit to give them understanding of the nature of the times. Furthermore, the Scriptures give us “signs” to watch for -“signs” that will signal that Yeshua is ready to return. The writer of Hebrews referred to these “signs” when he proclaimed that believers should encourage one another when they see the Day of Judgment drawing near! (Hebrews 10:25–27). Yeshua also referred to the End-Time “signs” in His Olivet Discourse, given during the last week of His life (Matthew 24; Luke 21). Speaking of a whole series of “signs” which He had given to His Disciples, He said; “When you see all these things, recognize that He (the Son of Man – Yeshua) is near, right at the door,” Matthew 24:33. The Second Coming of our Lord is the greatest single theme in Scripture! While there are approximately 300 prophecies in the Old Testament that foretold the First Coming of Christ …there are more than 8 times as many verses describing His Second Coming. In total, some 2400 verses throughout the Old and New Testaments reveal God's promises about the return of Yeshua (Jesus). The enormous number of prophetic verses about the Second Coming underlines the vital importance of this event in God’s plan for mankind. 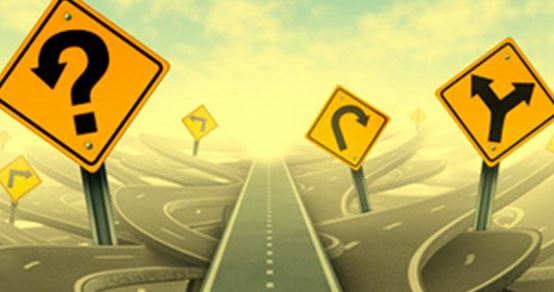 Consequently, we dare not ignore the prophetic “signs” pointing to the nearness of His return! The New Testament book of Jude recalls that righteous Enoch was raptured to heaven before the Flood… Jude revealed that Enoch prophesied about the Second Coming, when the Lord would return to earth with millions of His saints. “Enoch, also, the seventh from Adam, prophesied of these, saying: ‘Behold, the Lord comes with ten thousands of his saints, to execute judgment upon all,” Jude 14-15. The seventh from Adam; there were only five of the fathers between Adam and Enoch, 1 Chronicles 1:1-3. The First Coming of Christ was revealed to Adam; His Second, glorious Coming, to Enoch …and, the seventh from Adam foretold the things which will conclude the seventh age of the world. Jude might have known this either from some ancient book, or tradition, or immediate revelation… “Behold, (as if it was already done) the Lord comes!” The prophet John recorded our Lord’s final prophecy in the final verses of the book of Revelation; “And, behold, I come quickly; and my reward is with me, to give every man according as his work shall be,” Yeshua’ final message to His Church concludes with these words; “He who testifies these things says, Yes, I am coming quickly, Amen. Yes, come, Lord Jesus!” - Revelation 22:12; 20. During the early centuries following the ascension of Yeshua (Jesus) into heaven, Christians often greeted one another by saying; “Maranatha” which means; “the Lord comes!” Despite constant persecution from both the pagans and the officials of the Roman government, the early Christians rejoiced in the certain knowledge that Yeshua had prophesied that He would someday return to establish His Kingdom on earth. These believers knew that Yeshua rose from the dead on the 3rd day following His crucifixion just as He had foretold during His earthly ministry. The Lord was seen by many people during the 40 days following His resurrection and 30 years after He ascended to heaven in the sight of His followers, the apostle Paul wrote; “After that, he was seen of above five hundred brethren at once; of whom the greater part remain unto this present, but some are fallen asleep,” 1 Corinthians 15:6. 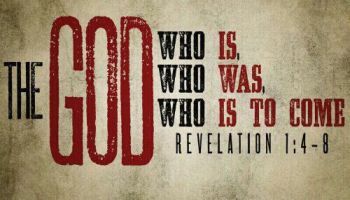 The truth of His death and resurrection was widely known and taught by the early Church, and encouraging a widespread expectation of His glorious soon return to destroy evil and establish His righteous government on earth forever! Just think how much closer we are to this since almost 2,000 years have passed! The Most important of “Signs” of Last Days ALL centre around the Nation of Israel… Perhaps one of the most significant “signs” of the times in which our generation live in is the re-birth of the Modern State of Israel in 1948. The Old Testament Prophets (Ezekiel 36:24–28; Isaiah 11:11-12) recorded in the Bible thousands of years ago that in the End Times is that God would supernaturally bring the Jews back into their ancient land – Israel …and that once He had done that He would NEVER allow them to be destroyed or scattered among the nations again! Despite the rise of anti-Semitism in the world, all of this fits the perfect plan of God to bring Israel into position to eventually be redeemed and reconciled back to God. Unlike some teachings that have crept into the church today - is the teaching that Israel has been replaced by the church! This is called Replacement Theology …and simply is NOT so, as God is true to His Word, and had declared that He would bring the Jews back into the land in the End Times. And, that God would gather the Jews from the four corners of the Earth in order to fulfil His plans for the redemption of man - both Jew and Gentile. Despite bringing the Jews back into the land of their forefathers from ancient times, the Bible is clear that the Jews would return to the land a second time in unbelief as they have until this time rejected Yeshua (Jesus) as the promised Messiah that was part of God's plan for the redemption of mankind. However, many Jews in Israel are waking up to Yeshua the Messiah and are called Messianic Jews. The Jews had spent almost 2,000 years “wandering” the Earth in other nations of the world. But, despite their unbelief (God knew beforehand that they would fall into unbelief) He devised a strategy to get his “stiff necked people” to eventually recognize Yeshua (Jesus) as their Messiah and this will happen at the Lord’s Second Coming when the Jewish people WILL finally recognize their promised Messiah as they will see the one that they “pierced” …coming in the clouds with great glory in order to establish His rule on Earth. The Bible says that they will mourn when they recognize their mistake! Today, Israel’s current condition finds her in a very serious condition as the world tries to divide Jerusalem and the Holy Land …as they want to birth their ungodly, un-Biblical “Palestinian” statehood in part of what is modern day Israel. This plan of a two-state solution is Satan’s plan and a terrible plot by Israel’s enemies, UN, EU and the International Community in order to bring a “so called” peace to the region. While from a human stand point this might seem to be the case but we know from the prodding of the Holy Spirit and the Word of God - the Bible, that there is more behind this “dividing of Israel” than meets the eye! The attempt to divide Jerusalem and Israel is one of Satan’s grandest schemes in order to destroy the Jewish people. Sadly, many people in the world (including many Christians) do not see this and instead continue to pressure Israel through; Boycott, Divest and Sanction (BDS) and Antisemitism (which is on the rise not seen since WW11). They want pressure Israel into accepting a godless covenant that will put them into a terrible situation to go against the God of Israel and the Bible… and will bring Israel into un-defendable borders and in a weakened overall state of security. The Palestinians still bluntly refuse to recognize Israel as a Jewish State and still to this day maintain their terrorism through Hamas in Gaza on the Southern border, Hezbollah in Lebanon and ISIS in Syria on the Northern border …all with the intention to destroy Israel from all sides. Sadly the world has either been unable to see this or in the case of many nations have become anti-Semitic towards Israel …and just simply do not care! Only US President Trump and his Administration and true Bible believing Evangelical Judeo-Christians across the Western World have proven to be true supporters of Israel! Jerusalem “Signs” of a Burdensome Stone… The status of Jerusalem has also become a major sticking point during 2018 when the US Embassy was moved from Tel Aviv to Jerusalem by promise keeping US President Trump. The EU, UN and International Community have bought into the idea that Jerusalem should be divided and made the capital of both Israel together with a new un-Biblical Palestinian state. 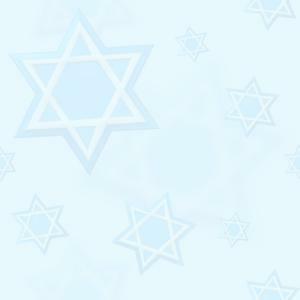 This decision and support is simply without merit as Jerusalem has been the city of Jews since ancient times. Jerusalem has NEVER been a Palestinian capital nor have there been a Palestinian Arab people until 1948! The Bible warns us that in the End Times the status of Israel and Jerusalem will be a major point for the world. The Bible specifically mentions Jerusalem as; “…a burdensome stone” - Zechariah 12:3 in the End Times and that all that concern themselves with it will be “cut to pieces!” With Biblical warnings like these it is unbelievable that the world community continues to ignore the plain warnings of God! “Signs” of Understanding… Another remarkable positive “sign” is the understanding of Bible prophecy. You see, the Hebrew Prophets often did NOT understand the End Time prophecies that the Lord gave to them. A good example is found in Daniel 12:8 - 9 - where the Prophet complains to the Lord that he does NOT understand the prophecies that have been entrusted to him. The Lord’s response was, “Don't worry about it. Just write the prophecies. They have been sealed up until the end times.” In other words, the Bible teaches that many of the End-Time prophecies will NOT be understood until the time comes for them to be fulfilled… And that is exactly what has been happening in the past 100 years. Historical developments and scientific inventions are now making it possible for us to understand End-Time prophecies that have never been understood before. 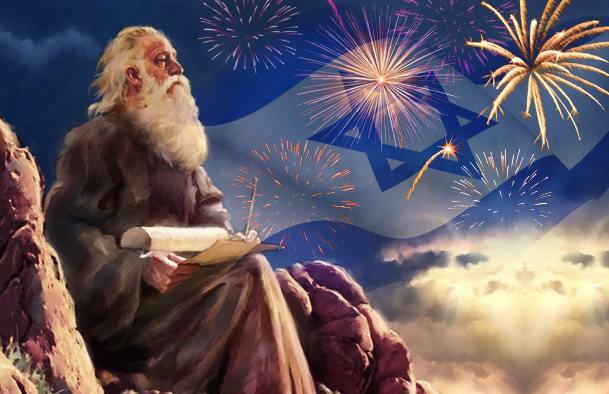 Take Israel for example, all of End-Time prophecy revolves around the Nation of Israel …but, before 1948 how could they understand those prophecies? Before 1948 Israel did NOT exist and so there was NO prospect that the nation would ever exist again? Israel proves that God exists, is true to His promises and controls of the future! We are living in “Signs” of the End-Times…! One hundred years ago in 1900 there was not one single, tangible, measurable sign that indicated we were living in the season of the Lord’s return. The first to appear was the Balfour Declaration which was issued by the British government on November 2, 1917. This Declaration was prompted by the fact that during World War I the Turks sided with the Germans. Thus, when Germany lost the war, so did the Turks, and the victorious Allies decided to divide up both the German and Turkish Empires. The Turkish territories, called the Ottoman Empire, contained the ancient homeland of the Jewish people - an area the Romans had named “Palestine” after the last Jewish revolt in 132-135 AD. In 1917 Palestine included all of modern day Israel and Jordan. In the scheme the Allies concocted for dividing up the German and Turkish territories, Britain was allotted Palestine, and this is what prompted the Balfour Declaration. In that document, Lord Balfour, the British Foreign Secretary, declared that it was the intention of the British government to establish in Palestine “a national home for the Jewish people.” Since the time of the Balfour Declaration, we have witnessed throughout the 20th Century the appearance of “sign after sign” pointing to the Lord’s soon return. 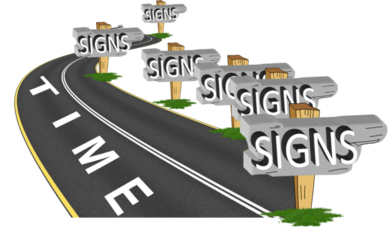 There are so many of these “signs” today, in fact, that one would have to be either Biblically illiterate or spiritually blind not to realize that we are living on borrowed time! So, what Time Is It? The book of Romans contains more than just the great plan of salvation. It carries the plan of how to live an effective Christian life in the midst of dark storms. It is a book that teaches what time it is and how we are to rule and reign with Yeshua (Jesus) in practical ways; “Furthermore, knowing the time, now is the moment to awake from sleep. For now our salvation is nearer than when we believed. The night is far spent, the day is at hand. Therefore let us take off the works of darkness and put on the armour of light. Let us behave properly, as in the day, not in carousing and drunkenness, not in immorality and wickedness, not in strife and envy. But put on the Lord Jesus Christ, and make no provision for the flesh to fulfil its lusts.” - Romans 13:11–14. The Biblical “signs” are clear for all to see, and even the scoffers will struggle to argue against it! Sure, many people throughout history have been proclaiming that they were living in the Last Days and that the end of the world was nigh! And, some of the Bible “signs” have always existed from the early days …but, never has there been a time before when ALL these events were evident in so many diverse places and with such frequency and intensity! Our generation is the FIRST generation to fulfil ALL the Biblical “signs” and without doubt we are living in the final years that the Bible prophesied were to come. “He answered and said to them, when it is evening, you say, fair weather; for the sky is red. And, in the morning, foul weather today; for the sky is red and gloomy. Hypocrites! You can discern the face of the sky, but you cannot see the signs of the times!” - Matthew 16:2–3. “Signs” of Prophecies being fulfilled… One of the most severe problems facing the Jewish people today is the rise of terrorism on Israel’s borders - due to terrorist groups like Hamas, ISIS and Hezbollah. 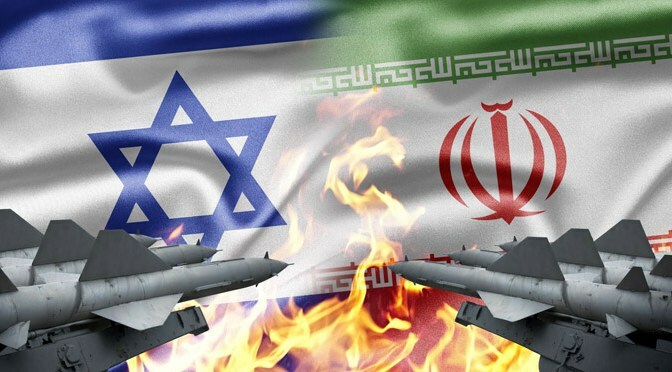 In addition, Israel faces calls for it to be “wiped off the map” by Iran! Turkey is NO friend of Israel as their leader Erdogan supports terrorism against Israel. This serious threat both by the Palestinian terrorist groups as well as by Iran have put Israel into an extremely serious position. 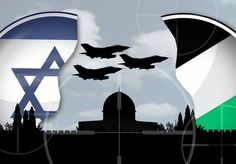 The threat of war and destruction on Israel has never been greater! These threats are gaining at fast pace and the stages towards the prophetic fulfilment of Isaiah 17 and Ezekiel 38 - 39 prophecies. It is Interesting to note that the Psalm 83 prophecy deals primarily with the immediate terrorist enemies of Israel that are currently residing on the borders with Israel. This is simply no coincidence! The Isaiah 17 prophecy could end up being fulfilled with the same or close timing of the Psalm 83 prophecy as it deals with the destruction of Damascus… and also refers to serious harm done to Israel due to the large build-up of missiles and other weapons on the borders of Israel. Syria is responsible for providing many of the weapons that have found their way into the hands of the terrorists. It is likely that in the next war between Israel and her neighbours that Syria will get directly involved and the prophecy of Isaiah 17 will be fulfilled. God only knows the final outcome! The signs clearly say, as so many rabbis and experts have confirmed, that we are living in prophetic times preceding the Messiah!